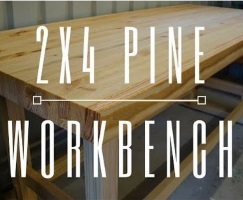 This is a brilliant build — the creation of an affordable, simple, heavy laminated workbench made out of construction pine 2×4’s. ** Particularly interesting is the clever use of a router to prepare the bench-top surface (watch for this in the 5:30 to the 9:00 minute section). A technique to store away for use in future woodworking projects! All construction was from pine 2×4’s except the pine dowels. 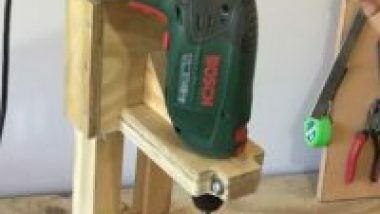 This is a good project for anyone wanting to build a sturdy workbench without breaking the bank. Will Matthews has also produced some excellent videos on restoration work. This bench is awesome. I looked to see if Will had a contact and I can’t find one. 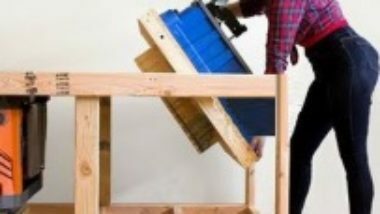 Any chance you guys might have the plans to this work table. Greatly appreciative. Like yourself (I noticed your comment in Wills Channel), I have looked right through his YouTube Channel and cannot find any method of contacting him, other than placing a comment (as you have done). His work is awesome isn’t it — in all of his videos he displays great attention to detail in both the work shown and the video editing – most impressive. Very pleasing to see the number of views that his channel receives – he certainly deserves the attention. (I hope that we have contributed to his success in some small way too – anyone viewing our posts increase his YouTube views accordingly). I note from his comments that he lives in Australia, (as I do), however there are no obvious Google entries for a Will Matthews (other than his YouTube efforts), so it appears that he has no other web presence where his name is evident. Sorry I cannot help you any further — I hope that he replies to your comment on his YouTube Channel and that you can obtain the plans for that magnificent bench! Thanks Ian!! Love your blog! Great for a beginner like me! Yes, Will’s work is great! Would love to have 1/20th of his experience! I’ll watch the vid again and take some notes. Already built the top. What a chore! But came out great so might as well put the time into the rest. One tip/hint I learned was put F-clamps at the end between ever board when glueing up. Will help some with the leveling and won’t have to plane as much from twisted 2x4s. I also doweled my (3) sections together hoping it would eliminate any other leveling problems. I used 1/2” dowels every 12 inches. Still had a little unevenness even after all the planning. That’s what twisted and bent 2x4s from home center will get you. Take the time to pick out the straightest you can find! Thanks for the response. If I get measurements on Will’s bench that seem to work out, I’ll try to get them to you. Have a good one!